The Royal Adelaide Wine Show (or RAWS, for the sake of sanity) wrapped up at the beginning of October. After the best part of a week of solid tasting and general hard work on the part of the judges, the Showground doors were flung open to a small group of media. Nick Ryan, Matthew Jukes and Michael Brajkovich MW talked us through the wine show process and then let us loose on a bracket of Chardonnay and a bracket of Shiraz. 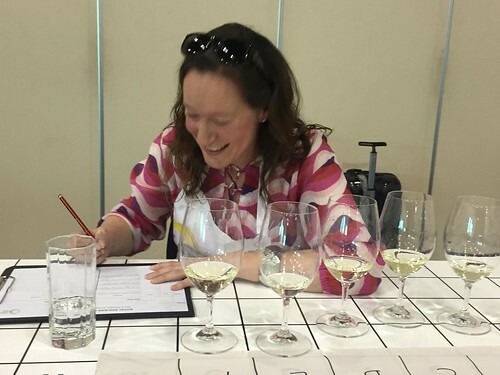 Wine shows (and, indeed, scoring in general) can be a little controversial – because obviously how a wine looks at any moment in time is highly subjective. At a show, in an attempt to even this out, wines are judged by panels and gold medal winning wines are looked at more than once. If you spend enough time around wine geeks, you’ll realise that it doesn’t take long for everyone’s preferences to more or less fall in line. Wines that can be a tough sell in the retail market are often beloved of professionals and hardened enthusiasts. Yep – there’s a reason why Riesling is so cheap (thank goodness) – it’s not the darling of consumers. We tasted two flights of six wines (Chardonnay and Shiraz) – and in advance we were told that there were three gold medal winning wines (including the trophy), one silver, one bronze and an also-ran. While wines (at the Adelaide Show) are scored on a 20 point scale, in reality only 10 of those points are used. 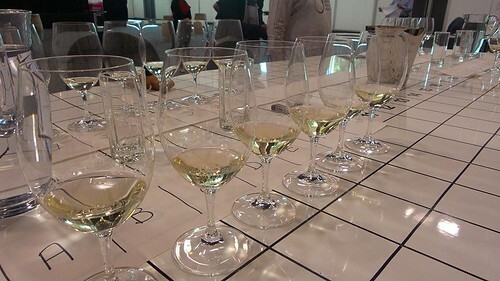 Wines scoring 18.5 and above are gold, 17 – 18.5 results in silver and 15.5 – 17 a bronze. Below 15, no medal is awarded. About 5% of wines are awarded a gold medal and approximately 50% get a medal of some type. Your average, drinkable, clean, but otherwise unremarkable wine will score around 15 – so in order to be awarded any kind of medal a wine does have to be a bit special. Chardonnay for elevenses? Don’t mind if I do! We started with the 2013 Chardonnays – a class of originally around 50 wines before moving on to the 2014 Shiraz – originally around 180 wines! Shiraz REALLY dominates at the Adelaide show … I can’t imagine why! What I found most fascinating about this exercise was where the ‘amateurs’ and the ‘professionals’ diverged. This was most evident in the Shiraz class where, for me, the ‘also ran’ stuck out like a sore thumb. And I mean REALLY stuck out. However, while I picked it I also knew that it was representative of a style of wine that is also very popular and I wasn’t surprised at all that the room was split. Many of us did score it down but just as many people loved it and scored it highly. I’d scored it a 15 – out of medal contention – but after a chat with Matthew Jukes revised that score down to a 13. He said that with a wine such as this, he would always score it down because there could well be someone on the panel who, for whatever reason, scores it surprisingly highly. When the average of the panel’s scores is taken, your 15 might be just enough to bump it up into bronze medal territory. There you go – strategic scoring is not just for reality tv! This was a great morning – it is always interesting to learn about wine and taste something new. And of course, meeting Matthew Jukes and Michael Brajkovich MW and talking wine with them was a real treat*. I loved that this was a small group – it meant that it was intimate and friendly and everyone got a chance to have some input without feeling any more intimidated than you might do with an MW in the room! It was especially interesting because the next day I attended the RAWS lunch and got to taste a whole lot more medal winning wine – not all of which was my cup of tea! I think it’s so important to remember that wine is about so much more than a score or a medal. As this session showed, everyone’s taste is different.